The latest addition to the Lifeline Green Series is now on Android, and it takes players on an all new mysterious journey. 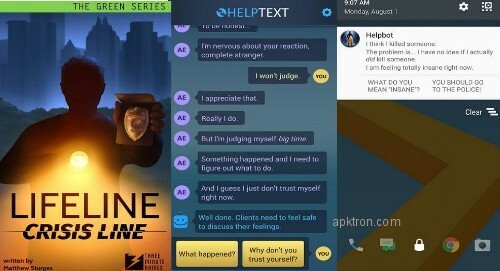 Lifeline: Crisis Line is a text-based interactive adventure in which you help a homicide detective in his criminal investigation! - The next chapter in Lifeline's hugely popular Green Series! - Discover clues, interview suspects, and help solve the interactive mystery. Your choices shape the story as you play! - Story and original score by New York Times best-selling author Matthew Sturges. - EN, DE, FR, JP, and RU language support. For screenshots and other details visit Play Store link above! Can you upload Mystic Messenger with unlimited hourglass, please?